This is the week Bishop Carroll has gotten used to practicing - state championship week. For Kansas high school football coaches and players, the feeling of practicing on Thanksgiving is unlike any other. Bishop Carroll has experienced this often lately, having played in five state championship games since 2007, winning the Class 5A title in 2012 and 2014. St. Thomas Aquinas, on the other hand, is still relatively new to having football practice this late in the season. A school more known for its success in the other kind of football, Aquinas has never won a state title and reached the final just three times. But when your coach is Randy Dreiling, expectations are always to play post-Thanksgiving football. Dreiling, now in his fourth year at Aquinas, will be coaching in his 11th state championship game since 2003 this Saturday when Aquinas and Bishop Carroll square off for the 5A state championship in Pittsburg. Dreiling, who took over a morbid program in Hutchinson in 1997 and took the Salthawks to nine state-championship games while winning seven, is taking the Saints to their second championship game in his four-year tenure. In his first season, the Saints lost to Bishop Carroll 39-7. While this is a business-as-usual week for Dreiling, he said he’s never stopped appreciating coaching during championship week. While Aquinas has never won a title, its presence isn’t a surprise. The Saints reached the semifinals the last two years, losing to eventual champion and Eastern Kansas League rival, Mill Valley both times. Bishop Carroll’s presence also isn’t a shock, but there was a tinge of uncertainty headed to the season. Longtime coach Alan Schuckman retired after 22 seasons, 21 winning seasons and two state titles. In came Schuckman assistant Dusty Trail. Having coached against Bishop Carroll at Aquinas and Hutchinson - Bishop Carroll ended Hutchinson’s run of seven straight state titles with a 21-0 semifinal win in 2010 - Dreiling has gotten to know Trail through the years. The Saints’ offense, using Dreiling’s flexbone system, has destroyed most opponents this year. The Saints have scored at least 42 points in each of their last six games, and they’ve scored at least 28 in every victory. The only time the offense stumbled came in a 27-14 loss to Bishop Miege. Cameron Jackson leads the powerful offense, having rushed for 1,390 yards and 19 touchdowns. Will Swanson has passed for 1,092 yards and eight touchdowns. 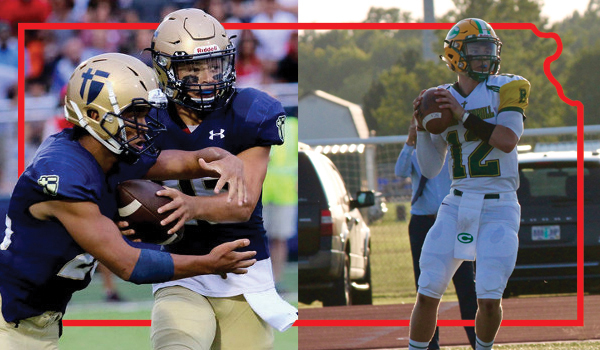 Bishop Carroll will counter with a potent passing attack, featuring quarterback Braden Howell. Last week, Howell’s arm was neutralized against previously-unbeaten Goddard, but he still damaged Goddard with 172 rushing yards. Carroll, whose only loss is to 6A finalist and defending champion Derby, scored at least 30 points in each of its first 10 games. It will be a battle between two strong programs who both expect to return home with the championship trophy.